The strategic location of Kidapawan City being at the foot of Mt. 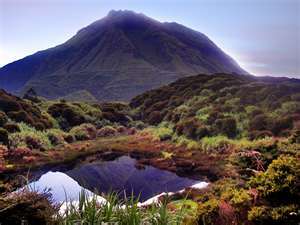 Apo – the country’s highest peak- offers vast tourism potentials and attractions for both local and foreign tourists who wish to embrace nature at its best. Scenic scenes of Mt. Apo’s twin peaks, breathtaking and thundering waterfalls, lakes and lagoons, endemic but exotic flora and fauna growing and thriving in its environment are just a few attractions that drive visitors to explore and visit it whole year round. It is considered a sacred place among native inhabitants as it continues to bless and provide them food, water and medicine necessary for their survival. Of the four major lakes comprising Mt. Apo, most popular are Lakes Agco and Venado. Thrill seekers hiking towards Mt. Apo’s summit will first take Lake Agco. Adjacent to the lake is the Lake Agco Mahomanoy Mountain Resort in Ilomavis, Kidapawan City. 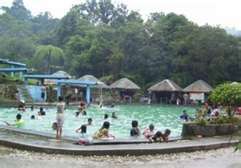 It features a 25 meter outdoor swimming pool as well as children’s pools, hot mineral tubs, natural spa, mini forest, camping grounds, native cottages, hiking trails, and boiling mud pools. The Mountain Resort in located in a dense forest surrounded by Mt. Apo’s lush greeneries. Its water source comes from Lake Agco where hot and cold water converge at an elevation of 1,250 meters above sea level. Just how hot the water is, is that it bubbles up the lake’s shore and hot enough to boil and cook an egg! It is heated by an underground volcanic vent near boiling point and enriched with minerals such as Sulphur – known for its medicinal value. As the rain waters penetrate the Earth’s soil fissure, the magma heats it up. Then the water rises to the surface carrying with it minerals coming from the rock’s stratus. Both the Lake and the Mountain Resort remain secluded and have retained their paradise like ambiance which attracts travelers to embrace the Earth’s beauty. Visitors will surely enjoy its atmosphere of serenity once they visit the place. A hike away from the Lake Agco Mahomanoy Mountain Resort is the 104 megawatt Mindanao Geothermal Field operated by the ENERGY Development Corporation. It draws its power from the natural heat underneath Mt. Apo. The said facility is itself also a landmark tourism attraction. Lake Agco Mahomanoy Mountain Resort as noted by those who experience its uniqueness, is where Fire, Air, Water and Earth converged as one.